The 2017 rhino poaching numbers were released yesterday by Dr Edna Molewa, South African Minister of Environmental Affairs (DEA). We look at the numbers behind the numbers. 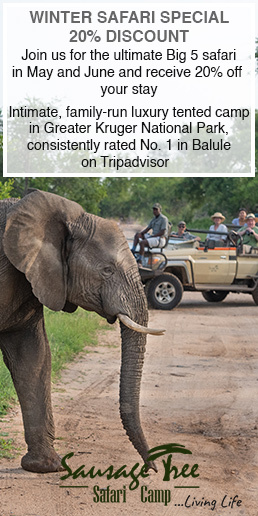 Apart from the Kruger region, only three other provinces achieve negative poaching numbers. Gauteng doesn’t really count with a drop from 6 to 4, and in the Eastern Cape the drop from 17 to 12 was probably due to the arrest of one gang of darters. But Limpopo, down to 79 from 90, is great news! Bear in mind that Limpopo had four years of high numbers around the 100 mark. The bulk of rhinos in Limpopo are privately owned and the Limpopo Rhino Security Group (LRSG) was formed two years ago in an attempt to join the farmers in targeting the onslaught. The group has been working with various SAPS units (from stock theft to crime intelligence), private anti-poaching units and the DEA’s EMI enforcers to bring down the poaching. It’s been a huge effort and it’s paying off. The legalizing of local trade did have some impact in the province with several of the farmers telling us they would sell horn the minute it became legal to do so. Several owners dehorned in anticipation of sales – possibly an added benefit as a deterrent. The rest of the provinces however, have been hit hard. Kwa-Zulu Natal was a disaster area, with the well-publicized onslaught in the provincial parks. How can we forget the cow and calf killed right in the heart of iMfolozi, at the game capture bomas, just after the organization’s game auction. How shocking that two security guards with one weapon between them were protecting millions of rands of assets that had just been sold. Almost all of the 222 poachings in Kwa-Zulu Natal were government owned rhinos – fewer than 5% from privately-owned reserves and farms. A massive dehorning effort from the private owners in the area throughout 2017 may have acted as a further deterrent. The vets were very busy in Limpopo and KZN during 2017. North West suffered a 72% increase – with tourists to Pilanesburg reporting the massacres. Several private rhino owners in the province were also targeted. 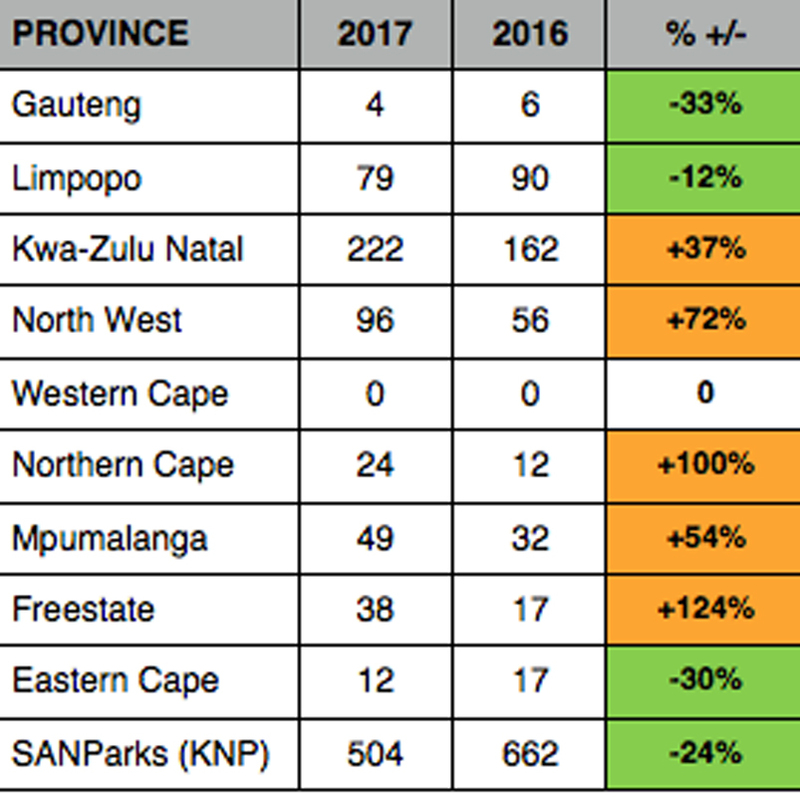 The Northern Cape and the Freestate continued their significant poaching increases from 2015 through into 2017 (100% and 124%). The bulk of rhinos in these provinces are privately-owned. 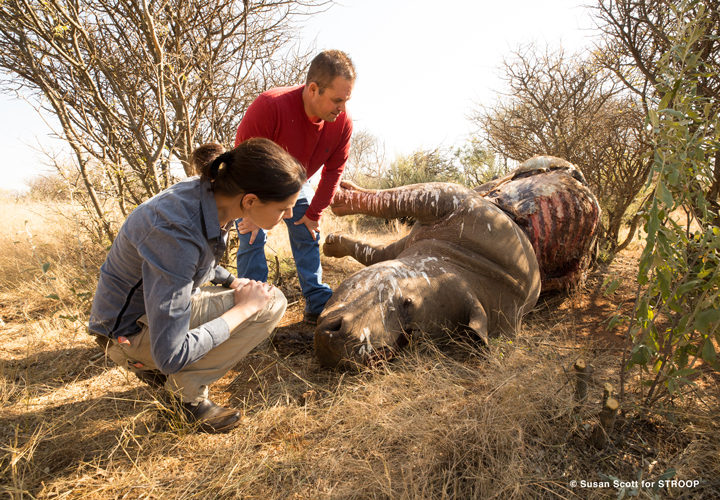 We visited a farmer just outside Kimberley in the middle of winter last year who had lost 9 rhinos literally overnight. 9 rhinos! Surely Kwa-Zulu Natal, the home of the white rhino, should be doing a better job of securing their future? Unconfirmed reports of alleged “capture” of some of the province’s judiciary and enforcement resources are a concern. And it’s sobering that even our own police minister tweeted last year that our police force has been infiltrated. 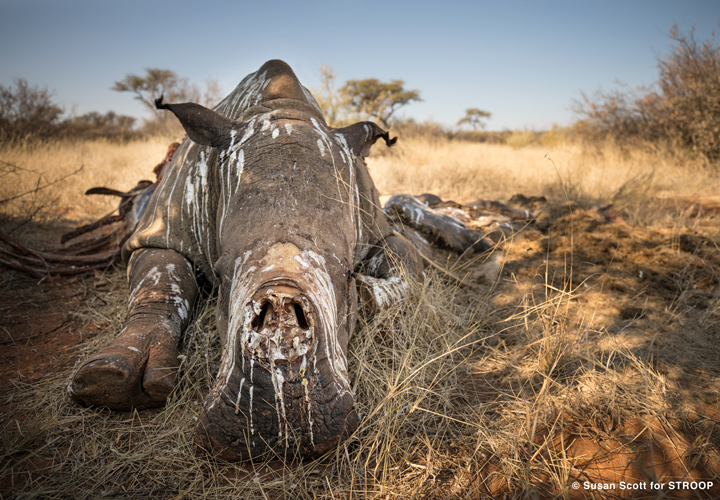 We know from rangers on the ground inKwa-Zulu Natal that many of the spoor from poachers they follow under the full “poachers moon” are of repeat offenders – caught previously with blood all over them, in possession of rhino horns. It’s simply not good enough that our dedicated rangers are putting their lives on the line, and yet not getting the support they need. Contrast that to what is happening in the Kruger National Park. We’ve been filming with the rangers on the ground there as well as the SAPS investigating officers and the special prosecutors from the NPA. Everyone works exceptionally well together and you can see it in their convictions, almost doubling from 58 to 111 last year. One of the reasons why the poaching has decreased in the park, is not only new technology coming in over the past year, but also, as Maj. Gen. Jooste always says, ‘technology can do a lot, but it’s the human element that makes the real difference’. And we’ve seen that success on the back of a team effort – from the Kruger ranger who ensures a clean arrest, to the SAPS investigating officer who makes the case watertight, and the prosecutor who doesn’t let the well-paid defence team of lawyers get the poachers off on technicalities. Editorial comment: We reported on how teams in the Kruger are working well together: Good news for Rhinos. In closing, it is with some heartache that we look at the figure of 222 poached rhinos for Kwa-Zulu Natal. Two of those rhinos we got to know well, and filmed on numerous occasions – Gugu and Impy. Gugu and Impy were orphans who were saved and taken to Karen Trendler and her team at the Thula Thula Rhino Orphange. They were poached when the orphanage, now closed, was attacked in February 2017. 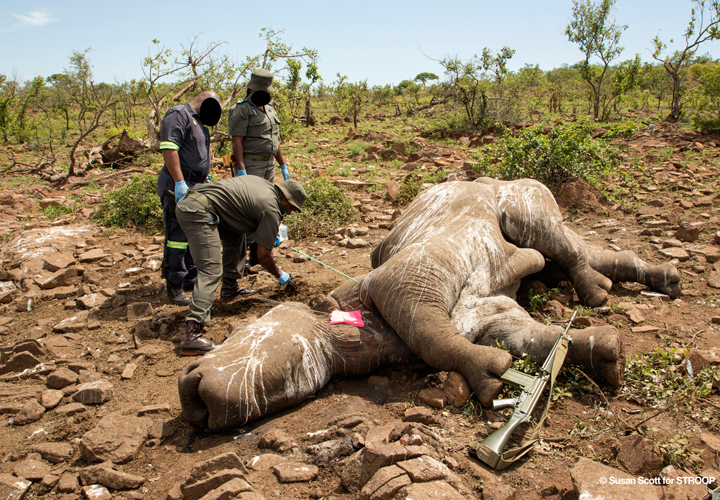 Gugu was killed immediately, but little Impy suffered tremendously and had to be euthanised while battling to breathe through what was left of his face. It must’ve been an awful thing to see him struggling to keep his battered head up out of the mud that surrounded him, threatening to suffocate Impy through his open nasal cavities. The irony, is that when he was orphaned, he was found next to his mother’s carcass drinking her seeping body fluid and eating the mud surrounding her to stay alive. 18 months later, here he was suffering the same awful, awful death. The South African feature documentary STROOP – Journey into the Rhino Horn War is an independently made film about the rhino poaching crisis – released in 2018. Expect unique footage – from the killing fields of Kruger to bush town courtrooms and the dingy back rooms of Vietnamese wildlife traffickers. This multiple award-winning feature documentary is available for digital download here.